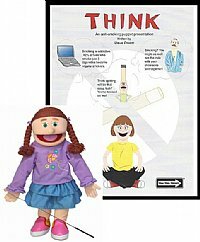 This multimedia tool designed for elementary and middle school students is a puppet presentation on anti-smoking. Sage, the main character who aspires to be a winning track star, lets others convince her that smoking is "cool." Join her and the other eight characters to see how tobacco users are losers. This will be a great presentation to perform at your church or school. This great book is paired with a 21" girl puppet to play the role of Sage.